The seller had no clue what he was sitting on. It may have looked like an early C1 Corvette but it turned out to be much, much more than that. Too bad the guy from the Tampa Bay, Florida area who first posted it for sale about five years ago on Craigslist only priced it at $700. Big mistake. It was the No. 1 Cunningham Corvette. Here’s what his ad claimed (typos included): "SERIAL # X53L on documented 1953 pre-production Corvette Frame. We believe this to be a 1953 Pontiac prototype that was to assume the name Longoria? Info received todate indicates that Zagato designed and PIininfarina constructed the body for GM in late 52. Might anyone have knowledge of some former FISHER BODY executive that could assist in further identifying this automobile?" Clearly this guy had no clue what he had. The No. 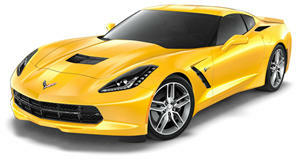 1 Cunningham Corvette is the most sought-after Corvette ever built, and is worth millions of dollars. The Cunningham Corvette, of which three were built, is a 1960 model year C1 made into racecars by Briggs Cunningham. All three raced at Le Mans that year, but only car # 3 finished, and it won its class. But then the cars were turned back into street cars and were sold. They disappeared for years. Number 3 was found first and restored. Number 2 was found in a California junkyard, but is now on display (and restored) at the Petersen Automotive Museum. Number 1, according to a Fox News report, has been positively identified and is now owned by an Indiana car dealer. No word on how much the guy ended up paying for it, but a full restoration is planned, which will cost more than $500,000 and will take at least a year. After that it’s expected the owner will sell it, asking somewhere from $3 million to $7 million, if not more. So, the lesson here is that if you plan to sell something on Craigslist, or any other online platform, do your homework first. Who knows? You could be missing out on millions.